Monday, December 19, 1859.Springfield, IL. In response to requests from Ohio Republicans and state officers, "with my grateful acknowledgments to both you and them, for the very flattering terms in which the request is communicated." 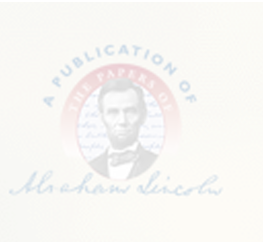 Lincoln consents to publication of his debates with Douglas, and sends copies. "I wish the reprint to be precisely as the copies I send, without any comment whatever." Abraham Lincoln to George M. Parsons and Others, 19 December 1859, CW, 3:510. He also writes to his Columbus supporter, Samuel Galloway, introducing John G. Nicolay, who will bring debates copies and publication instructions. OCHP—Unpublished letter, Galloway Papers. He writes $9.30 check to "C. Loch," bootmaker. DLC—Original.